BSK 2013 coming up! In ten days, I'll be going to Borås for one of the two "nerd peaks" of my year. I've got the hotel room booked, my vacation cleared for Friday the 1st of November, and I'm ready for some last-minute tech this Saturday with my team mates. Good times will be had. I was actually thinking about writing about building on a budget today. 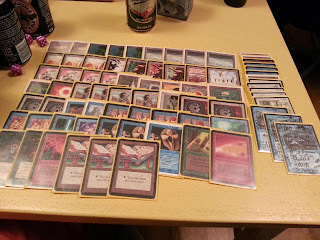 I started to write about the sweet decks that can be built with a budget of less than, say, $500. The format can seem very intimidating to get in to, as many decks may have a price tag of a few cars. It is highly possible (and encouraged!) to play the format with a student's budget though. Time constraints tonight made me save this topic for another week; but among my favorite "cheap" decks are Electric Eel Aggro and Tax Edge. If you have any particular topics you'd like me to write about, feel free to come with suggestions. The win condition is "unfairness". Beware of Magic the gathering!